The Swiss watchmaker has picked out four smart watches to complement black tux New Year parties. 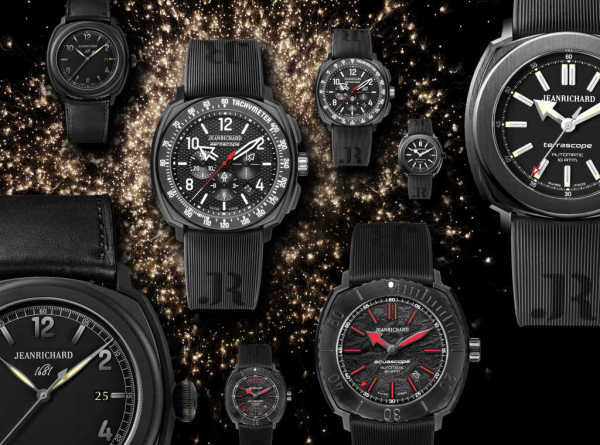 Get ready for a sparkling countdown to 2015 with JEANRICHARD! This extraordinary edition includes four all in black pieces, chosen from each of the four JEANRICHARD collections. All the watches feature varied versions of dials and straps in black. The totally black Terrascope model with a DLC coated case and its black matt dial will complement any classy and smartly-tailored outfit on a glamorous New Year’s Eve. The Hokusai Aquascope timepiece is perfect to have on your wrist once the fireworks lighten up the skies. The watch stands out with its rhodium-coated hands with red luminescent material and PVD-coated stainless steel case in all black. The JEANRICHARD Aeroscope Chronograph guarantees an unforgettable countdown and take-off in the upcoming year. The model has a black DLC-coated lightweight titanium bezel and case. Finally, the fourth selected timepiece for Black Tie New Year Adventures is the perfect companion for a classy and stylish start to a new year’s adventure. The classic 1681 with manufactured movement, flaunts an elegant yet daring vintage-look. All four timepieces come with a black strap, in rubber or Barenia calf skin, and feature a black case. You can locate a JEANRICHARD store from here. Tagged Accessories, LifeSpice, Luxury watches, Sartorial Notes. Bookmark the permalink.